High-resolution 8-channel USB 2.0 audio interface with Octane Preamp technology that enables tracking of large music ensembles, band recordings, or miking an entire drum set with pro-grade audio components. It provides 8 XLR+1/4” combo inputs with individual metering and selectable phantom power that ensure pristine and precise audio recording with up to 24-bit/96 kHz resolution. They also feature the Octane Preamp technology and dedicated line-input circuitry for clean, professional recordings, and USB/Analog Direct Balance control for zero-latency monitoring. Interface further provides 2 front-panel instrument inputs for easy access, dual headphone outputs with selectable source for custom mixes and monitoring, and 8 balanced 1/4" outputs and dedicated control room output. Cubase 7 LE software is included for out-of-the-box music creation and up to 8 channels of simultaneous audio recording, as well as Waves plugin bundle that features AudioTrack, Eddie Kramer Effect Channel, TrueVerb, L1 Ultramaximizer, and Manny Marroquin Delay, to add a professional finish to the production. Dimensions: 483 x 150 x 43 m – standard 19” 1U rack size. Weight: 1.98 kg. 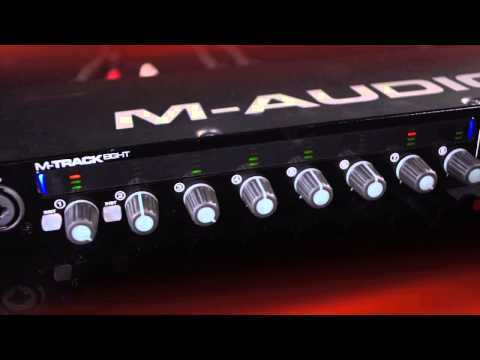 Do you own M-Audio M-Track Eight or have you had a chance to try it?